Table of Contents with Preview for Blogger. ~ The Blog Doctor. You are here: Home > TOC > Table of Contents with Preview for Blogger. Table of Contents with Preview for Blogger. 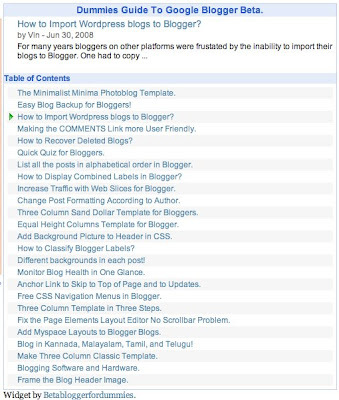 A Table of Contents is essential for each blog so that readers can look at the post titles and decide which post to visit. The Blog Archives widget can be configured to show all post titles but it has the dates also cluttering up the view. Then there are the arrows collapsing past months so that all post titles are not seen at once. Classic templates have a Previous Posts section which shows only the previous ten posts. Here also all the blog posts cannot be seen. 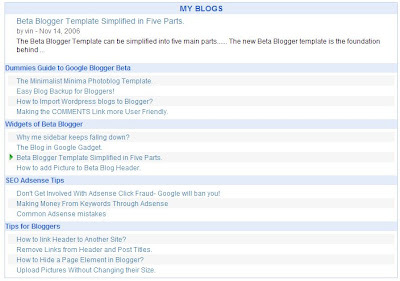 Change the code in green CAPS ('MYBLOG' and 'BLOG_TITLE') to your blog name and the title of your blog. Also sign up for your Google API Key and put it instead of "<<INSERT KEY>>" in the above code. You can see a live demo at top of the posts column on Widgetry blog. Thanks alot for all of your helps, i have solved many different problems thanks to your site and the replys you send in the help group. I cannot do without looking at your site atleast once a day. I have learnt many different things. What are the links of the two blogs? The latter has posts dating back to 2001. I can, in "archives", view all titles, in both. I was able, in the the first, to use the (somewhat famous) generated by idte.vcss.php ... am I spelling that correctly? to view ALL titles. In the latter, I could view only the titles for only the CURRENT year. When I "View Source" for the first, (last time I looked) I can clearly see generated feeds. For the latter, I cannot. Strange at best. I have posted in Google Groups with, as you might imagine, no response. Well, duh and thanks. I can't recall what I did wrong the first try with your code, but it came up blank! Now it works like a champ (as you may see, if it lasts, paranoid that I am). Thanks again, from a dolt. How to Increase Traffic with External Content? How to attract traffic with Attractive Content? I tried to set it up for one blog and it says "feed could not be loaded". The blog is private until I have worked out the formatting and some content issues. Is that the problem? Presently private blogs in Blogger do not send out feeds, which is what this gadget is based on. For some reason, after I put the widget up, nothing ever shows. It just says "Loading..." and never changes. Help! What is the address of the blog you put it in and what are the links you aded in the widget? Trying to stick feed it into one of my other blogs: Loren's Rich Internet Life. Any help, would be greatly appreciated. In Settings---->Site Feeds options for slimodsoc blog choose the short option for posts feeds and save. Thanks very much, Vin. The Table of Contents gadget works great. One question -- is it possible to eliminate the green arrow and the movement from one entry to the next? I am trying to get a "title widget" on my blog. I was able to follow your instructions and open up an HTML box, but it is blank.......so, now how do I get a title list of my blogs to post into it automatically? What is the blog address where you have put this? "feed could not be loaded"....could it be the reason that I use the feedburner? What is the address of the blog whose feed you are attempting to load? Thanx so much for this wonderful resource site! You're a doll! I have a little problem: I am unable to change the site feed to SHORT - I think because I have them set up to feedburner. Is it a private blog? I have been looking for something like this, however, it is too large. It sure would be nice if you could do it with a drop down list, or a scrolling list, so it won't take up so much space. Thank you for all the help your site has provided. I replaced "MYBLOG" with "beetlesinthebush" and "BLOG_TITLE." with "Beetles In The Bush" - any ideas? My Table of Contents at Widgetry is still working so there is no error in the code. I pasted the code and made the modifications again - making sure nothing else was modified. I get the same message. Is there some other blog setting I might be missing? It is working in my test blog here on top of posts column. Hello, first of all thanks for all the help. I have a question, is it possible to change the order of the feed to show first the oldest post (ascending view)? Sort it using Yahoo Pipes. Get the RSS feed URL of the pipe. Paste it in the code shown in above post instead of the blog feed url. Customize this feed to show as short using Customize tab. Then use this feedburner url in the above gadget. Thanks for the reply. I have a Feedburner account. and the feed url is: http://feeds.feedburner.com/Indiaspirituality. The widget is working, but the problem is that it shows only 25 feeds (but this time it works when site feed is seleted 'full'). I checked at Feedburner ->Optimize -> Your Feed. It also shows only 25 feeds. I unsucessfully tried the option max-results=999. I started blogging since last Feb and added feedburner on 29th May 2008. I have 168 posts till date. I also tried your other option to create Java Script, but same only limilted posts are shown in the preview. Also the link you mentioned for Jscript says that " this service may go off soon ... better option is avaialbe to google..."
The widget is very good ad works great. I really appreciate your efforts for helping bloggers. Your blog is really great. I had just submitted a comment before 10 mins. I just spotted "Yet Another Table of Contents-YATOC." This was the one i was looking for. Since i have 168 posts, i just added a scroll bar (height:500 px and over flow:auto). It looks good. I will also try to create sitemap as per your insturctions when i get free time. I have subscribed to your blog. Thank you so much for creating a resource rich blog. Hello! Thank you for your post. It helps a lot! I have a couple of problems with this widget. I only get the last posts and not every post on my blog (there are more than 500). And the frame get cut on the right side. Do you know how I can make it work for every post? And maybe adapt its layout for my blog? Try this smaller Google Gadget which shows ALL blog posts. I cannot tell you how many times i have tried your Table of Contents html and followed it exactly.....it still will not work......any other suggestions? Your above feed is working properly. Try changing it to Full in Settings---->Site Feed. I've tried that, but it still says "Feed could not be loaded". What to try next? Thanks again. It is up, on the right side (above photo search engine). Do it again and change only as per the instructions. Choose a gadget from My Gadget Showcase blog and I will send you the code by email. Send me email so I can send you the code. Curious problem. (I've posted before, above, as "APF".) In the cited blog, with a humongous title list, the gadget has quit posting titles. The gadget lists 2008. Several entries have been posted in 2009. I'll have to admit, it's a REALLY long list of titles, and it's asking a lot of the gadget and on, and on. But curious, nonetheless, as to why it stopped at the top rather than the bottom. FWIW, it should be noted that I *entirely* rewrote and restyled the GoOgle template from scratch; but I should think, that has nothing to do with the gadget's ability to fetch titles. Try the Table of Contents Google Gadget (between gadget 10 and 11) which shows all posts. First of all thenq very much for this post.